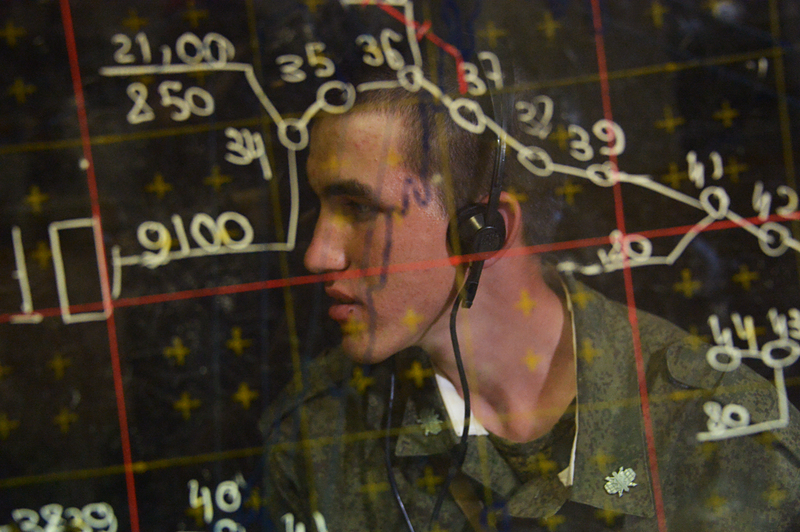 A serviceman at the command headquarters of the combat employment center during an Air Force and Air Defence Force tactical exercise at the Ashuluk firing range. New joint air defense system allows Moscow and Yerevan to access each other’s intelligence data on threats in the sky above the Caucasus region. Armenia already hosts Russia’a 102nd Military Base in Gyumri. The base is the home of the 988th Surface-to-Air Missile Regiment, which is equipped with an S-300V missile system as well as the relevant aircraft detection, tracking and missile guidance radars. Tank, motor-rifle and artillery units are also based there. There are three MiG-29 squadrons deployed in the region, which if necessary can intercept enemy aircraft and, together with surface-to-air missile units, provide Armenia with effective air defense. The Russian units will support Yerevan’s own substantial air defense capabilities, which include Soviet-made SAM systems such as the S-125 Neva with a range of up to 12 miles, the Krug with a range of 27 miles, the newer and more modern S-300PS surface-to-air missile systems with a range of 93 miles and the short-range missile systems Osa-AKM, Shilka, Strela-10, and Igla. Once joined with the Russian air defense system, the Armenian Air Defense Troops will have access to all the information available to Russian Southern Military District units and the country’s air and missile defense troops. However, the air defense above Nagorno-Karabakh will remain the remit of the Armenian Defense Ministry; Russian air defense systems will not be involved there. “Russia and Armenia do not have common airspace, they are separated by Georgia. The joining together of their air defense systems will allow Moscow to create an additional ‘air defense umbrella’ beyond its borders,” said former deputy air defense commander of the Russian Ground Troops, Lt. Gen Alexander Luzan (ret.). He added that the new agreement will be an additional check on Turkey, which is both the strongest military power in the region and has the backing of NATO. “We know from experience what Ankara may do even without Brussels’ approval or contrary to its wishes. Whereas, a joint Russian-Armenian air defense system will become a serious warning to it,” Luzan said, noting that the 102nd Military Base had already acted as a deterrent to Turkish moves in the region. Armenia is also on the frontline of air and missile defense for the Collective Security Treaty Organization (CSTO). The new Armenia-Russia agreement will act in cooperation with other agreements already in place between CSTO countries, including a joint air defense system of the Western region (Belarus-Russia) and a joint air defense system of the Central Asian region (Kazakhstan, Tajikistan, Kyrgyzstan, Russia). “The establishment of a joint CSTO air defense system is a strategically important decision. Furthermore, Russia, Armenia, Belarus and other CSTO countries are creating a single radar field, which should ensure air defense against threats posed by NATO member states, and Turkey in particular,” said Lt. Gen Norat Ter-Grigoryants (ret. ), a former deputy chief of staff of the USSR Ground Troops and one of the founders of the Armenian Armed Forces. Viktor Litovkin is a military observer for the TASS news agency.